Three years ago David Stanton retired from his career as a school teacher and literacy specialist. He is now busier than ever. 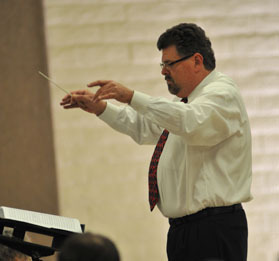 For starters, he was appointed musical director of the Palos Verdes Symphonic Band in May of 2011. As the director, he is in charge of rehearsing the 70-member ensemble, planning their musical programs and conducting their performances. 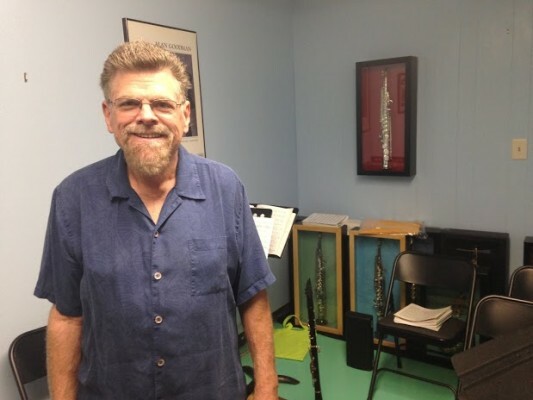 He also teaches music at AMUSE Palos Verdes Music Center in Rolling Hills Estates and performs as a clarinetist in a number of side bands. Stanton spent an earlier part of his life as a professional musician. He began playing clarinet in middle school and fell in love with the instrument. He went on to study music as an undergraduate at the University of Southern California and then moved to New York to get his Master’s degree at the Manhattan School of Music. Stanton enjoyed a storied career in New York City. He performed as a classical musician on Broadway, in operas, at Carnegie Hall and the Lincoln Center. He recorded with opera legend Kathleen Battle and accompanied tenor Carlo Bergonzi at the New York City Opera. On his off days, he taught clarinet at Princeton University and Long Island College. This was how Stanton discovered his passion for teaching. Stanton began his new career in the Teach for America program. He was assigned to an elementary school in Compton where he taught third and fifth grade. He then became a literary specialist and spent his last years in Compton educating teachers on literacy. He didn’t fall back into music until he was recruited as music director for the Lake Center Middle School in Santa Fe Springs. In 2011, Stanton was offered an early retirement bonus and decided he had been in public schools long enough. “I thought it would be better to retire too early than too late,” he said. Meanwhile, he had been playing in the Palos Verdes Symphonic Band for 11 years as first clarinetist. His love for music called to him again. He realized he wasn’t done teaching. Stanton enjoys combining his love for music with his passion for teaching. The elementary school program feeds into the middle school and high school bands, and Stanton likes being able to help mold young musicians at the start of their playing. He tries to encourage students to try the clarinet. Stanton also tries to teach students to learn musical pieces by ear, and not just by sheet music. Stanton’s musical skill and ability to teach is highly valued at the Palos Verdes Symphonic Band. The band began in 1962 as a place for Palos Verdes instrumentalists of all levels of expertise to play for their community. It now boasts 70 members. One such member is George Bird, former mayor of Palos Verdes Estates and current councilman. “The band is made up of professional musicians, senior members of the community, former marching band geeks, students and those who collectively share an interest in performing for the enjoyment of the entire community,” Bird said. The band’s youngest member is in middle school and its oldest are well into their golden years. In the band, Stanton’s abilities both as a performer and a teacher have proven essential. The Symphonic Band has expanded from its local roots to include members all over the South Bay and Los Angeles. As its membership has grown so has its quality. Tuba player and concert coordinator Howard Korman credits Stanton with the band’s growing success. The Palos Verdes Symphonic Band plays seven or eight concerts per year. Their performances include a Green Hills Memorial Day concert, the Rancho Palos Verdes Fourth of July celebration, winter holiday and Mother’s Day concerts at the South Coast Botanic Garden and a summer Pops Concert. “We are also performing a piece by a local composer, Carl Rigoli,” said Stanton. “There will be solos by several musicians including trumpeter Carvell Holloway and flutist Kimberly Bell.” Tickets are just nine dollars for adults and kids under 12 are free. Stanton is justifiably proud of this year’s band and programming. But he is quick to give credit to his fellow band members, too. Stanton’s attempts to cultivate the talents within the Palos Verdes Symphonic Band are proving fruitful. Attendance is on the rise for all of the band’s performances.